According to the legend, martyrs under Diocletian; feast, 15 June. The earliest testimony for their veneration is offered by the "Martyrologium Hieronymianum" (ed. De Rossi-Duchesne, 78: "In Sicilia, Viti, Modesti et Crescentiae"). The fact that the note is in the three most important manuscripts proves that it was also in the common exemplar of these, which appeared in the fifth century. The same Martyrologium has under the same day another Vitus at the head of a list of nine martyrs, with the statement of the place, "In Lucania", that is, in the Roman province of that name in Southern Italy between the Tuscan Sea and the Gulf of Taranto. 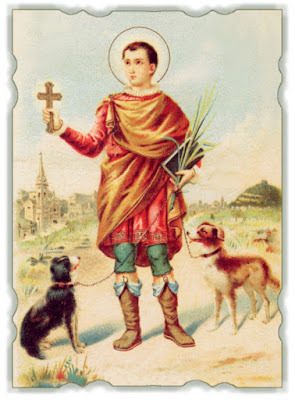 It is easily possible that the same martyr Vitus in both cases, because only the name of a territory is given, not of a city, as the place where the martyr was venerated. This testimony to the public veneration of the three saints in the fifth century proves positively that they are historical martyrs. There are, nevertheless, no historical accounts of them, nor of the time or the details of their martyrdom. During the sixth and seventh centuries a purely legendary narrative of their martyrdom appeared which was based upon other legends, especially on the legend of Poitus, and ornamented with accounts of fantastic miracles. It still exists in various versions, but has no historical value. Almighty and eternal God! With lively faith and reverently worshiping Thy divine Majesty, I prostrate myself before Thee and invoke with filial trust Thy supreme bounty and mercy. Illumine the darkness of my intellect with a ray of Thy heavenly light and inflame my heart with the fire of Thy divine love, that I may contemplate the great virtues and merits of the saint in whose honor I make this novena, and following his example imitate, like him, the life of Thy divine Son. Moreover, I beseech Thee to grant graciously, through the merits and intercession of this powerful Helper, the petition which through him I humbly place before Thee, devoutly saying, "Thy will be done on earth as it is in heaven." Vouchsafe graciously to hear it, if it redounds to Thy greater glory and to the salvation of my soul. Grant us, O God, through the intercession of St. Vitus, a due estimation of the value of our soul and of its redemption by the precious blood of Thy Son Jesus Christ; so that, for its salvation, we bear all trials with fortitude. Give this Thy youthful servant and heroic martyr as a guide and protector to Christian youths, that following his example they may after a victorious combat receive the crown of justice in heaven. Through Christ our Lord. Amen. St. Vitus, glorious martyr of Christ; in thy youth thou wast exposed to violent and dangerous temptations, but in the fear of God and for the love of Jesus thou didst victoriously overcome them. O amiable, holy youth, I implore thee by the love of Jesus, assist me with thy powerful intercession to overcome the temptations to evil, to avoid every occasion of sin, and thus to preserve spotless the robe of innocence and sanctifying grace, and to bring it unstained to the judgment-seat of Jesus Christ, that I may forever enjoy the beatific vision of God which is promised to the pure of heart. Amen. My Lord and my God! I offer up to Thee my petition in union with the bitter passion and death of Jesus Christ, Thy Son, together with the merits of His immaculate and blessed Mother, Mary ever virgin, and of all the saints, particularly with those of the holy Helper in whose honor I make this novena.